The Garage Plan Shop offers a variety of pool houses designed to suit your needs and to compliment your architecture. 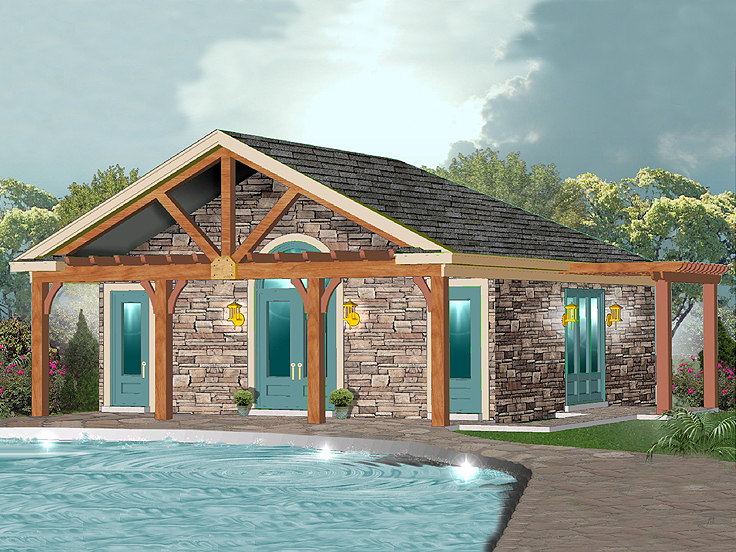 A very basic plan, 006P-0001, presents an economical pool house with a full or half bath. Essentially it provides a place to use the restroom and change or shower poolside. Simple, yet an effective and convenient amenity for family and guests. For a more elaborate plan, consider 006P-0032. This design offers both inside and outside storage rooms. Inside there is a full bath with shower, party room with kitchenette and a weight room. Outside, notice the exterior pool shower, front and back porches plus an arbor on the side. This is a great accompaniment to any pool, and offers an excellent means for entertaining via the vaulted party room without dripping guests tracking through the main residence. Plus, this pool house plan can double as a guest room. There is even space for a stacked washer and dryer which may come in handy for guests who decide to take a dip before changing out of their clothes. 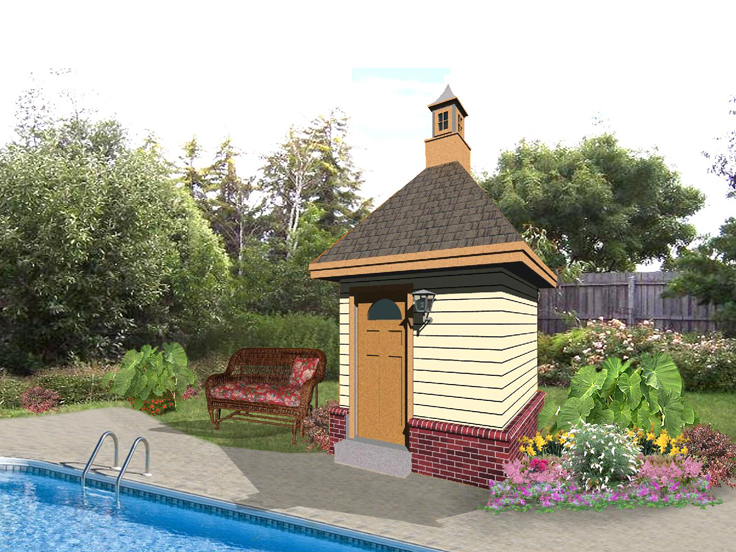 These two options are just the tip of the pool house collection offered by The Garage Plan Shop. Consider plans with outside party rooms, grilling porches, and eating bars. Party in style with hot tubs and saunas for your guests. Get practical with storage space for your pool equipment and washer and dryers for your guests to use. Expand your own living spaces with hobby rooms or exercise rooms. Pool house plans are available with garage bays for protecting your growing fleet of vehicles. Plans combined with apartments present a world of possibilities as guest rooms or housing for family, hired help, or even boarders. Take a moment to assess your needs and remember modifications and custom plans are available too.